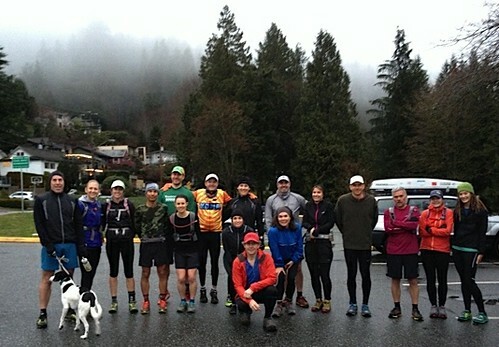 Report: As usual it was drizzling in Deep Cove but it didn't last long and was relatively warm and dry for the whole run! There were 18 starters and Bella representing the canine Fatass contingent. The climb out of Deep Cove rapidly spread the group out and, apart from a few mountain bikers, the trails were pretty quiet. The stretch up Seymour was mud central and the trail maintenance folk were having a hard time keeping everyone on the 'green carpet'. As I turned off the main Seymour trail one of the mountain bikers landed on their head, two feet are better than two wheels sometimes! At least there was no snow and ice this year, just mud! I bumped into Phil just before Hyannis Drive and we caught up on life, the universe and everything. He started early as he wanted to be off the trail before 1:30. The section past Hyannis Drive was in Winter Wonderland mode, definitely worth a walk when the snow comes. Apart from a patch of ice after the one bridge before the turnaround things were pretty normal, thanks for the warning Erik and I hope the 'wolf' pack of dogs didn't bug Bella? On the return trip over Seymour I spent a fair bit talking to Denis, a dedicated North Shore trail walker, always great to get different perspectives on what we do for fun. All in all a fun Pure Satisfaction run, thanks everyone for coming out and I hope it prepares you for whatever adventures you're planning for 2014. Survey: Please take a moment to give us your feedback via this brief survey.